Ragdoll, the name refers to the tendency of the Ragdoll for all his muscles to relax when they are lifted or picked up and again fully relax in your arm when they are held, this breed is always friendly, loving, docile, gentle and serene. Although they have many more outstanding qualities, it is their individual personalities that many people have been smitten by! 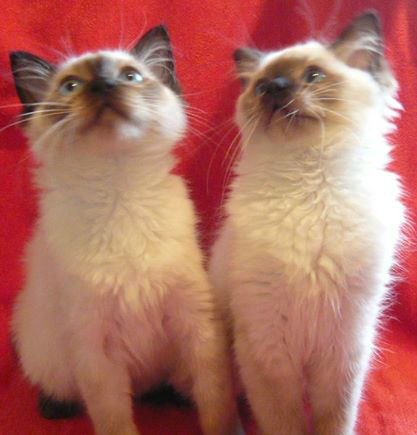 Although one would imagine that cats with a long silky fur coat such as possessed by Ragdolls, would require a high degree of maintainence and hard work with constant grooming to keep it looking good... you'd be very pleasantly surprised to discover that Ragdoll coats are REALLY EASY to maintain. Unlike Persian cats, who do need daily grooming, a RAGDOLLS COAT generally needs little care, their coats generally look after themselves as the fur tends NOT to tangle plus because they have less undercoat Ragdolls Moult less fur ~ Once weekly brushing to remove any loose hairs to prevent 'fur balls' is more than sufficent for these babies! 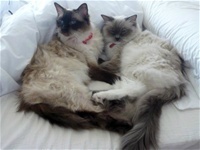 Ragdolls are such people-oriented cats, they adore human companionship, becoming very attached to their owners. Many Ragdoll owners say their cats eagerly await their return home, waiting near the frontdoor. As a Ragdoll owner you are rarely alone, Ragdolls want to take part in everything that happens within the household and often 'join in' to offer their help. Because your Ragdoll is such a happy and contented breed they tend to remain close by the neighborhood, but you should always be aware and look over them so not too let them wander off mainly because being as they are such a trusting breed and see everyone as a friend they can get taken or stolen.... Being so sociable, it's a good idea to concider owning at least Two Cats in a household should you be out at work for long periods or away often. Ragdolls are a calm breed, but also highly active and enjoy their playtime, due to their placid nature, Ragdolls get along with other household Pets, and Children are not a problem as this breed tend not to expose their claws during playtime. Raggies can easily be kept in smaller appartments, as they are just content to sit on a sunny inside window sill with a good vantage point and survey the World as it goes by! Ragdolls are generally not very talkative, having a soft voice. Yet they do possess a wide vocabulary of a vast array of sounds, owners can grow to distinguish between these various calls and their meaning, people liken it to your cat 'talking' to you! Ragdolls are less stubborn than other breeds so are easily trained. Lastly, always remember Ragdogs are People too!